While in Launceston, we had a few hours to kill so we asked a waiter what we should do to fill in couple of hours. He said “Ahhhh… Monkeys in the park?” Monkey’s in the park? We arrived at the park at 4.25pm. There was a sign saying the monkeys are there until 4.30pm. 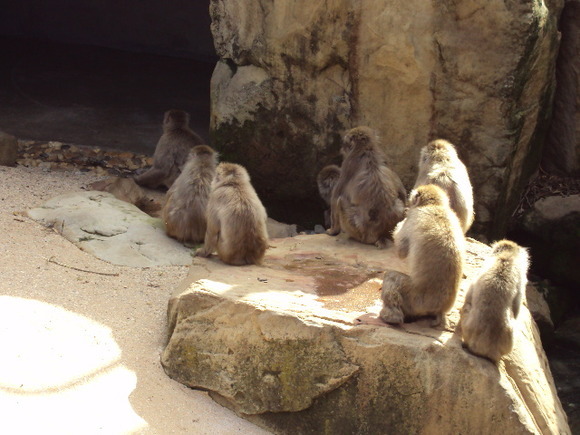 I pulled out my camera, and snapped this photo of a group of monkey’s loitering. A second after this photo was taken, and a door inside that cave opened, and whooosh! All the monkey’s were gone.